Shrimp is added to this easy slow cooker marinara sauce near the end of the cooking time. Use peeled and cooked shrimp or frozen cooked shrimp which has been thawed. It's a basic marinara mixture flavored with fresh or dried basil and optional oregano. I always add crushed red pepper flakes to my pasta sauce, but that's optional.The marinara is served with hot cooked spaghetti or angel hair pasta. Or serve it over polenta or bow tie pasta. In a slow cooker, combine the tomatoes with the tomato paste, garlic, salt, basil, oregano, if using, seasoned salt, black pepper, and crushed red pepper, if using. Turn the slow cooker control to high and stir in the parsley and cooked shrimp. Cover and cook on high for about 10 minutes longer. 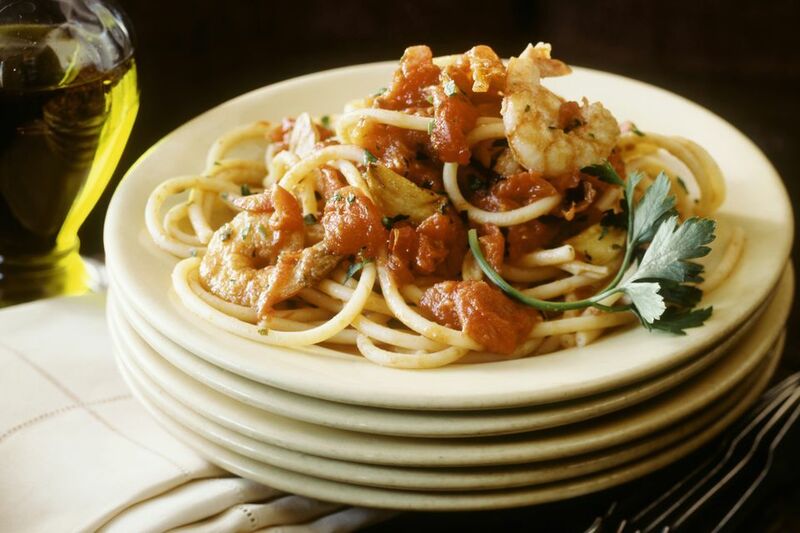 Serve the shrimp and marinara sauce with hot cooked spaghetti or angel hair pasta. Sprinkle servings with Parmesan cheese and serve extra Parmesan at the table.